Boho Beads is finally finished, and the bright, bold colors make me want to do a little happy dance! 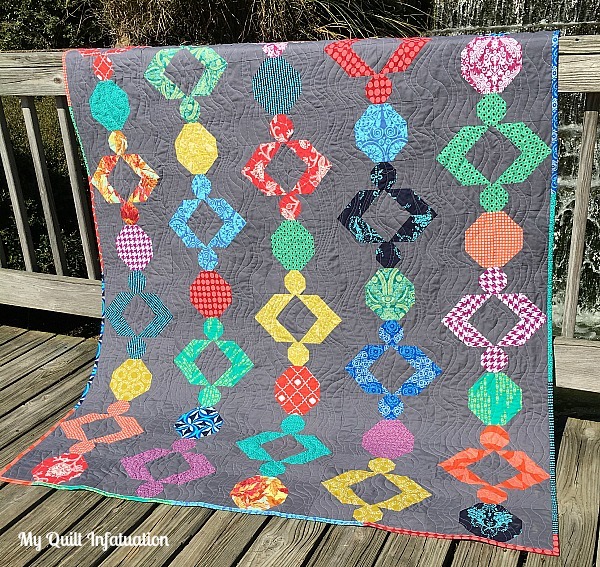 In case you missed my last post about this quilt, I designed it to look like funky bead curtains. 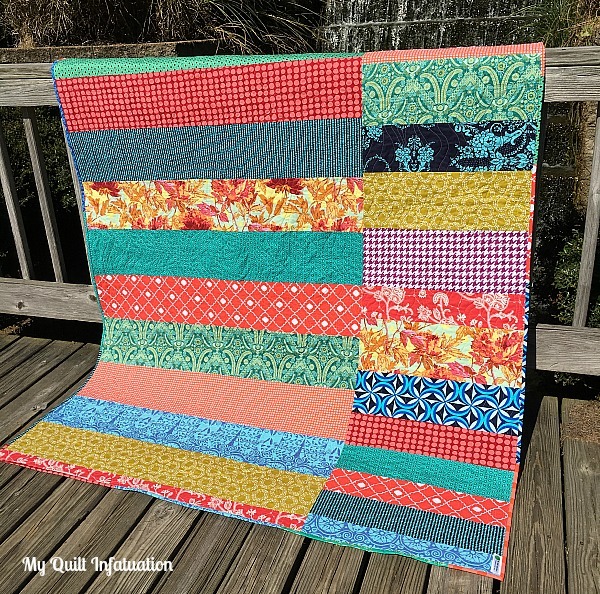 There are a couple of things in this quilt that are out of the norm for me. First of all, the background fabric on this one is Kona Coal. I do like gray backgrounds, but I usually gravitate toward a lighter shade. Even though I was hesitant to use such a dark gray, the colors really sing against it, and I'm happy with the choice. Another break from my comfort zone is the quilting. 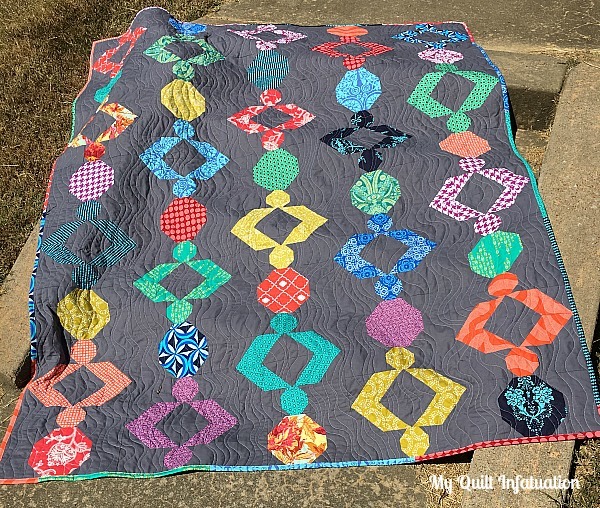 To give the beads some movement, a friend in my guild suggested that I quilt this one with some free motion curves, waving gracefully down the quilt. This friend is a rockstar longarmer, and I knew her suggestion was spot-on, and best of all, achievable on my domestic machine. The curves are pretty organic (which just sounds better than saying they're imperfect, ha! 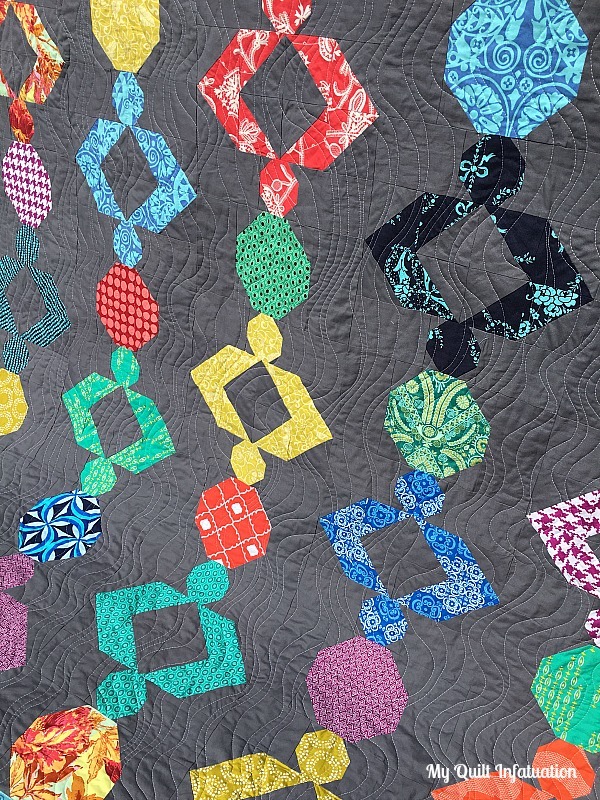 ), and they move in varying widths down the quilt, creating a cool ripple effect. The result is great, but it took much longer than stippling. Like waaaay longer. Usually, I match the quilting thread to the background, but since I knew I didn't want to darken the prints, I opted to quilt with white thread. It really adds to the movement. Per the norm, the backing is pieced from the leftovers, and I even made a scrappy binding! Making this quilt was so much fun, and I am so excited to say that it is available in my Etsy and Craftsy shops! The pattern is written in three sizes, and includes cutting diagrams and full color illustrations for every step. 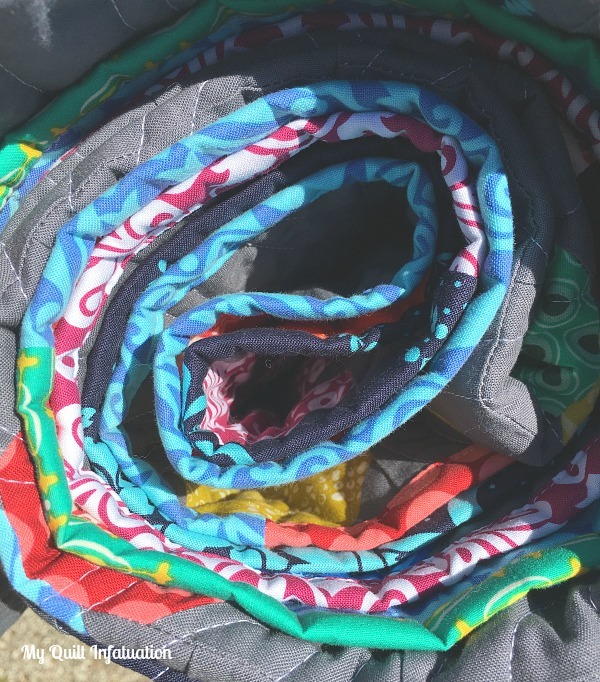 This is a perfect pattern for a fun-loving, free spirit! Check it out! Awesome! I love the quilting. 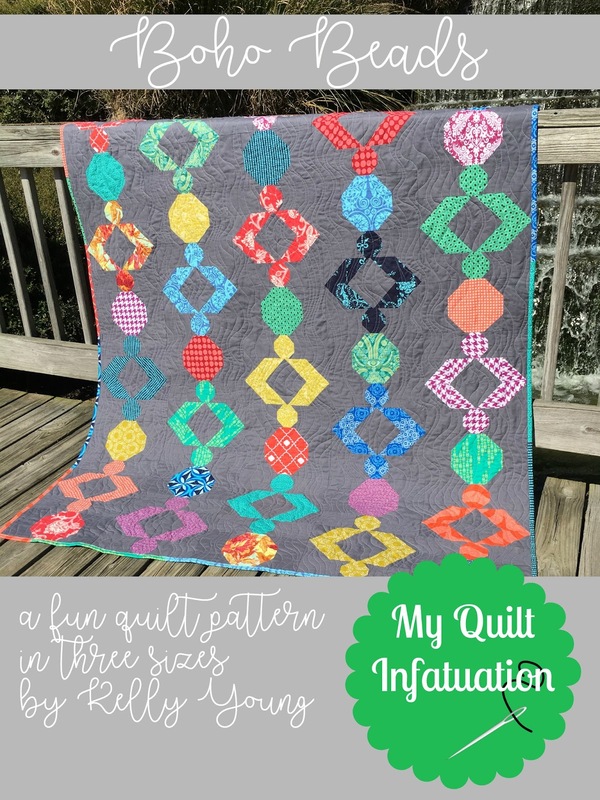 That motif works well for me, especially on large quilts. Did you use your free motion foot or walking foot? I find the walking foot easiest over large areas! Kona Coal was a great choice for the background. Great finish. Gorgeous! You come up with the coolest patterns! So pretty! And I love the dark gray background! I usually pick a light background, but I've been thinking about trying slate gray or navy blue. A wonderful design. I am sure it will be picked up and reproduced by the quilting community in no time. This one is so pretty, Kelly. It reminds me of paper lanterns swaying in the breeze. A very fun pattern. The quilting really adds to sense of sway to the beads.